Whilst describing ‘Grizzly Man’ to a friend who hadn’t seen the documentary I stated that Werner Herzog is one of the finest documentary makers of all time. I fear I may have put the mockers on my own estimations of Herzog’s wprk before I had watched ‘Wheel of Time’, as it turned out to be one of the dullest documentaries I’ve ever seen. I wondered whether I have a problem with Buddhism, or should I say the Westernized wishy washy Buddhism that I’ve encountered this year when on my own personal spiritual exploration. To give you a little context, I am currently studying on a University course that promotes the idea of personal development; part of my course encouraged me to explore my spiritual side. So, ever open to new ideas and experiences I decided a few months ago to visit my local Buddhist Centre in Norwich. It was a Sunday, if I recall correctly around four o’clock in the afternoon. I remembered that I was a little hungover after an all-nighter, so perhaps I wasn’t in the best frame of mind. I turned up at the Buddhist Centre, sat awkwardly on a settee for a few minutes and watched several people, the regulars, walk in. It seemed everybody was hugging each other as they gathered. Being not the most tactile of people I shuddered. There was me, and two other first timers nervously perched on the settee. When the hugging ceased we were taken upstairs, politely asked to remove our shoes and told to grab a few red cushions from a cupboard. We then went into this large room and placed our cushions on the shiny wooden floor. I looked around and followed whatever the regulars were doing, piling my three cushions in an uneven fashion. A man wearing a white robe walked into the room. He lead the group in a nonsensical chant towards a picture of Buddha on the wall. They lost me from that point onwards. Not willing to give up completely on Buddhism I attended a drop-in meditation at the Multi-faith Centre on my University campus. This was different, no chanting, no hierarchy, no cultish hugging rituals. We simply were encouraged to relax, and feel comfortable in our own headspace. I sensed from my experiences at the drop-in meditations that the whole purpose of Buddhism was not on the community or ceremony but to try and find some peace within your own mind. 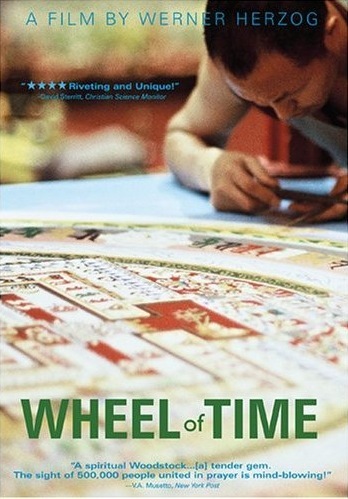 Herzog’s ‘Wheel of Time’ covers the two Kalachakra initiations of 2002 that were overseen by the Dalai Lama. Focusing mostly on the first initiation that took place in Bodhgaya as opposed to the second which took place in a soulless exhibition hall in Austria. Thousands of Buddhists make the pilgrimages, several hundred thousand in the case of Bodhgaya. I think Herzog struggles to tell the personal stories of some of the pilgrims. There is almost an invisible barrier that prevents their spiritual consciousness translating over to film. Instead we observe the rituals, people gathering, people wandering, people getting animated and excitable, and that odd guttural chanting that was sampled on some of the tracks on the classic Beastie Boys album ‘Ill Communication’, but nothing springs to life for the uninitiated viewer other than a sense confusion. It is difficult to try and understand what’s happening. The usual cautious Herzog narration permeates the documentary infrequently, and in ‘Wheel of Time’ the pictures fail to tell the story, and given that there is so much to be understood, not least for those not au fait with Buddhism, it seems Herzog got lazy. This could be due to Herzog’s reluctance to engage in the religious aspect of this subject. Unfortunately the director’s detachment could be misconstrued as a lack of interest in his subject. This is perhaps represented best by the tacked on coverage of the Dalai Lama’s trip to Austria. This entry was posted in Reviews and tagged Buddhism, Dalai Lama, documentary, Werner Herzog. Bookmark the permalink.